Murder She Wrote fans will recognize this gracious 1888 Victorian residence as the home of TV sleuth Jessica Fletcher. Located in charming Mendocino Village, Blair House Inn is renowned for stunning ocean views, cozy featherbeds, serene atmosphere and remarkable construction of clearheart Redwood. We serve a healthy, hearty breakfast in our dining room. Pets welcome with advanced reservation. If you're bringing Fido, make sure to read our pet policy. 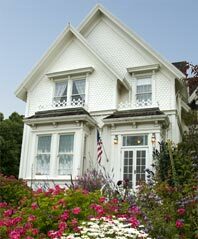 Come to Blair House and enjoy Mendocino. We want you to feel at home. Your comfort and happiness are our concern. A variety of shops and restaurants within three blocks. We look forward to your visit with us in Mendocino, a village that time forgot. Walk through our quiet streets and remember small town America. See the breathtaking beauty of the sunset over the Pacific. Enjoy your stay at Blair House. Let us show how we can make your visit the best vacation you've ever had.